If you’ve some leftover cake slices just crumble them and make this decadent dessert, eat and thank me later. 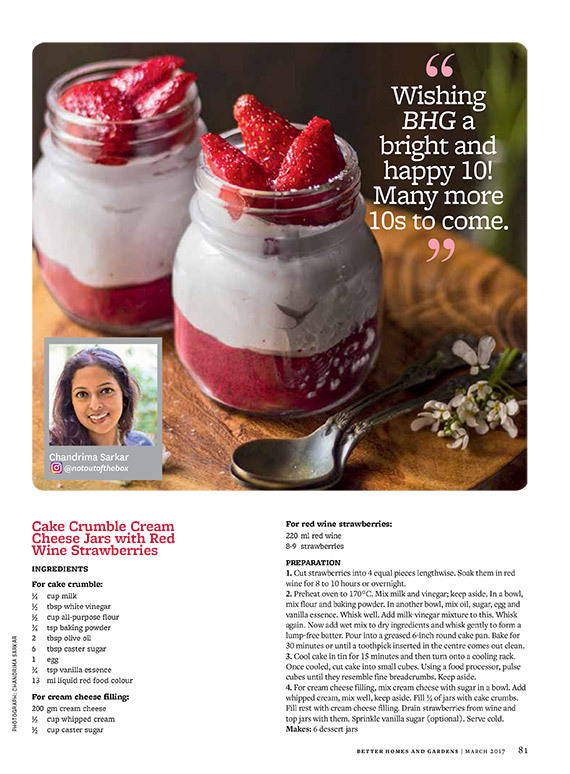 🙂 This Cake Crumble Cream Cheese Jars with Red Wine Strawberries recipe of mine was published in Better Homes and Gardens India Magazine’s March 2017 Anniversary issue. Cut strawberries into 4 equal pieces lengthwise. Soak them in red wine for 8-10 hours or overnight. Preheat oven to 170 degrees C. Mix milk and vinegar, keep aside for 5 minutes. In a bowl, mix all the dry ingredients (flour and baking powder). In another bowl, mix oil, sugar, egg and vanilla essence. Whisk well. Add milk + vinegar mixture into this. Whisk again. Now add the wet ingredients to the dry ingredients and whisk gently to form a lump free batter. Pour the batter into the greased 6″ round cake pan. Bake for 28-30 minutes or until a toothpick inserted in the centre comes out clean. Cool the cake in the tin for 15 minutes and then turn onto a cooling rack and leave there until cooled. When cooled, cut into small slice cubes. By using a food processor, pulse the cake cubes until they resemble fine breadcrumbs. Keep aside. 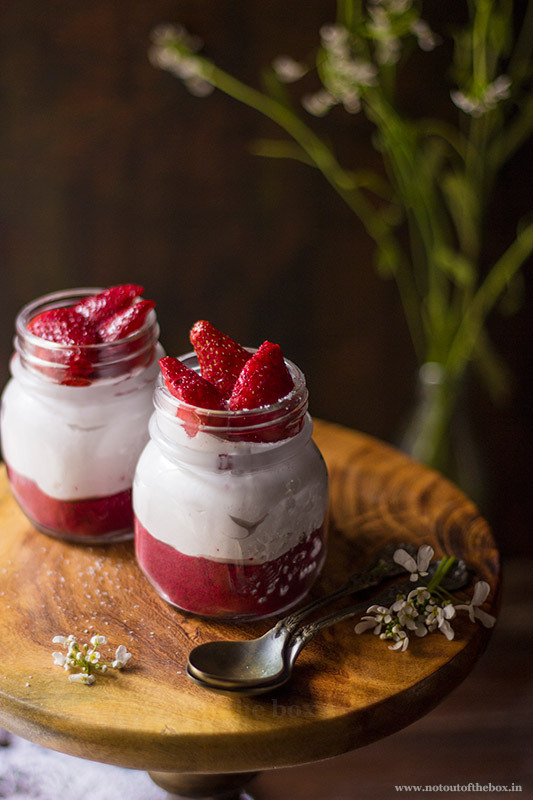 To make the cream cheese filling in a bowl, mix cream cheese with sugar, add fresh cream into this. Mix well and keep aside. Fill ¼ of the jars with cake crumbs. Then fill the rest of the jars with cream cheese filling. Drain the strawberries from wine. 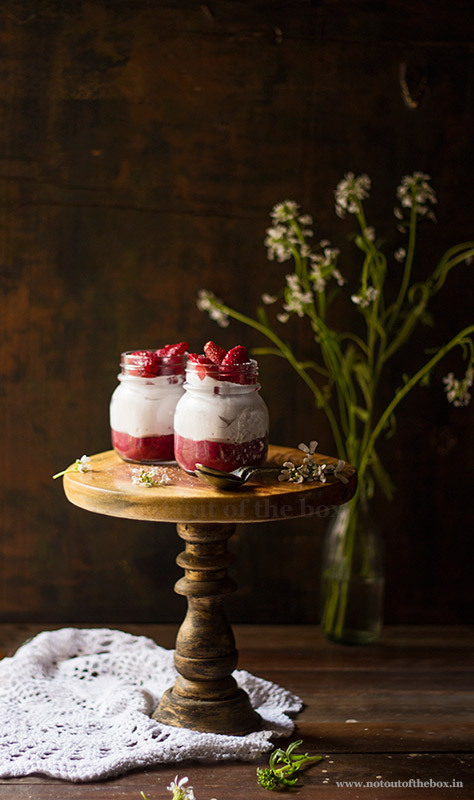 Top the jars with these red wine strawberries and sprinkle some vanilla sugar (optional) on top.